If you enjoy playing football or soccer you might be interested in a new game which has been created called Teqball, that allows you to use all your footballing skills and ball control to score points against your opponents in a very different way. 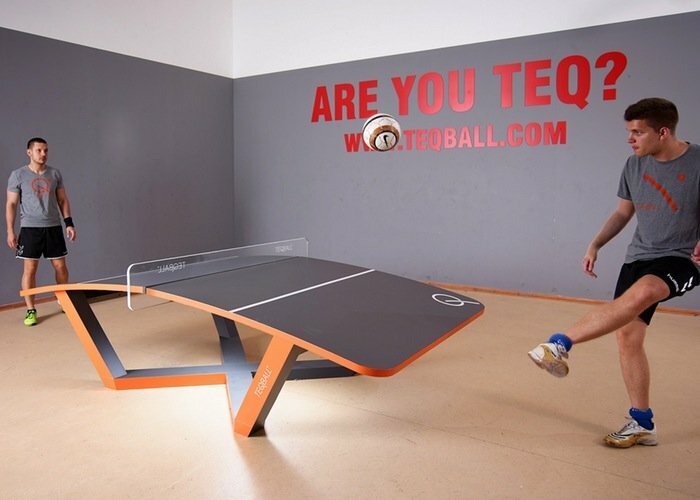 The Teqball game is played on a curved table which is similar in size to that of a table tennis table, and called the Teqboard. Watch the video after the jump to learn more about the newly created Teqball game and see it in action. Its creators explain : “Teqball is simply the cleanest form of football. There is no physical contact between the players and according to the official rules of the sport, it is forbidden to touch even the equipment. As a consequence, the risk of injury is very low. No brutality, no fake dives. Teqball is played on and around the Teqboard, which has been developed with a scientific approach after years of mathematical and physical calculations, and empirical tests. The Teqball project is currently over on the Kickstarter crowd funding website looking to raise enough pledges to make the jump from a concept to a worldwide game. So if you think Teqball is something you would enjoy playing with friends or family, visit the Kickstarter website now to make a pledge and help Teqball become a reality.